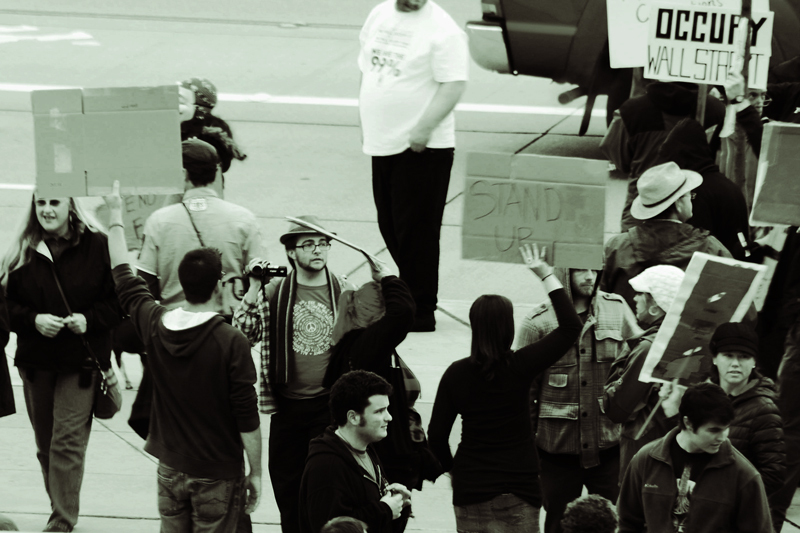 Occupy Tacoma initiated its first action eight days ago, on October 7, 2011. I went to this first march expecting no more than a couple dozen at most, a scattered handful being more likely. What I found, instead, was what The News Tribune reported to be around 200 people. I was shocked, and happily so. I’m impressed that the Occupy Wall Street movement has spread as virally as it has. I just took part in my own local version, Occupy Tacoma. A local paper, The News Tribune, posted a blog during the march saying there were about 200 people present. That doesn’t seem like much, but…honestly, I expected a couple dozen at most. Tacoma isn’t a city known for protests. We’ve got Seattle to the North of us and Olympia to the South; those cities are protest magnets. Stuck in between the two, my own city doesn’t seem to get that active very often, probably because the more protest-minded citizens find larger groups to share their anger with elsewhere. Occupy Tacoma looked different from Occupy Wall Street, as all the #Occupy events take different tactics. Some take all the legal measures, some take a more anarchistic approach, some get violent, some stay peaceful…the thing that impresses me, though, is the variety of people in the crowd. A lot of people like to dismiss protests – any protest – because all they can see are “anarchist punks” or “lazy hippies”. This is already a poor mindset to have for any protest, but it’s especially inaccurate for the #Occupy events across the nation. At Occupy Tacoma, I saw people of all ages, all walks of life. Sure, there were folks there who would fit the stereotypes you’d expect at a protest. But there were all other types there, as well. And everyone there, whether they fit the idea of a “stereotypical protester” or not, was an American – more importantly, a human being (well, okay, there were some dogs as well) – who has grown sick of seeing the American dream kicked around by corporate interests. 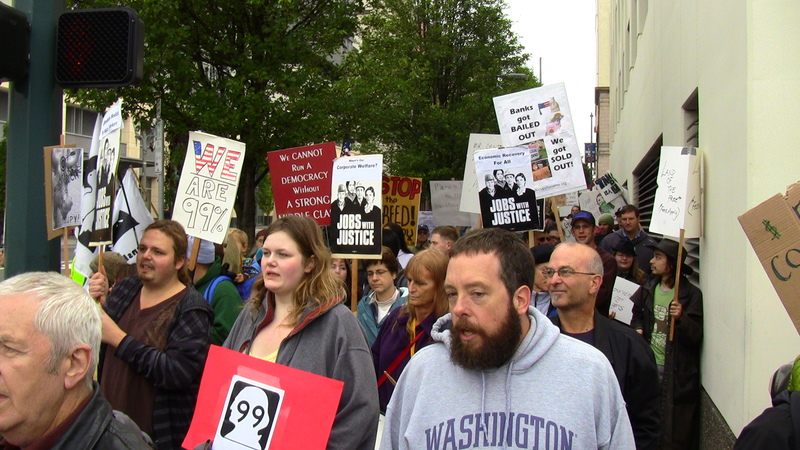 Occupy Tacoma marches toward the Federal Courthouse. Photo by Adam J. Manley. Those were my initial thoughts, as recorded on Google Plus. Since that day, I’ve taken part in community-driven planning meetings for the continuation of Tacoma’s arm of the #Occupy/99% movement. And today I was surprised to see even more people than last week show up to the march and rally we held today. Hundreds more turned out at People’s Park, marching down with us to an assortment of sites before ending with a rally at Tollefson Plaza. The energy was nearly sparking in the air. 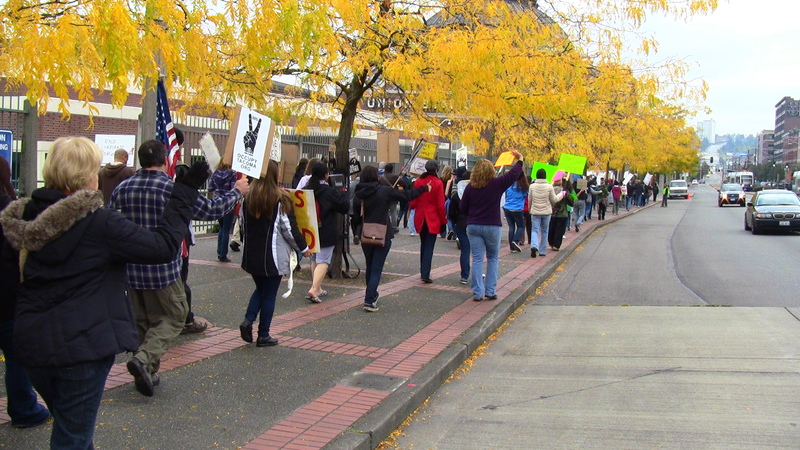 Occupy Tacoma marches down Pacific Avenue after flooding Wells Fargo Plaza. Photo by Adam J. Manley. After the rally, a smaller (but not insubstantial) portion of the protesters moved on to Pugnetti Park – which Occupy Tacoma has renamed “Occupation Park” – on 21st & Pacific, next to the Washington State History Museum. A barely known little thing that few even realize exists as they walk or drive along the side of it, it is now the site of Tacoma’s occupation. If you have any time in the coming days and weeks, take a few minutes, a few hours or even a few days, if you can, and join Occupy Tacoma in solidarity with the rest of the 99%. The music in the video at the top of this post is “Faster Than The Eye Can Perceive” by DJ Krod, courtesy of ccMixter. The link to your Google Plus 404’s. It’s working fine for me, even if I’m not logged in. Problem on your end? Adam, You did such a GREAT video on the Occupy Tacoma march. I was there, but it’s nice to be able to see it all the way you put it together. It is really powerful and I hope to see more…more videos, more marches, more people becoming part of Occupy Tacoma/Wall Street. Thanks!